NABHUB: NAB Show 2019…Just Warming Up! Camera makers have done a really good job of listening to what people want. Coming on strong since last year, many camera makers have made big strides in introducing some new camera models or making significant upgrades to existing models. While we can’t get into them all, here are some of the models that I will be taking a close look at this year. Ok, in reality, I look at all of them! However, these are some that I'll dive into right now. 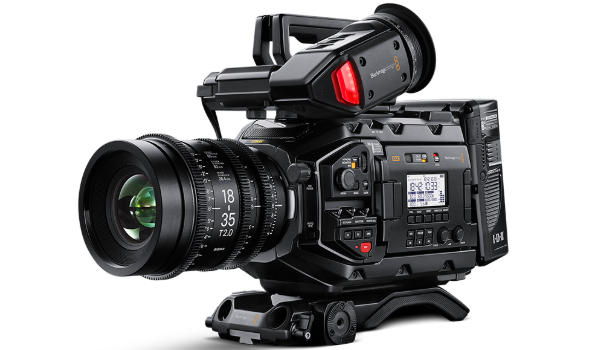 The new URSA Mini Pro 4.6K G2 features entirely new electronics for higher speed processing. Also included is a new Super 35mm 4.6K image sensor that captures up to 4608 x 2592 pixels with 15 stops of latitude at up to 3200 ISO. This allows shooters to record full sensor 4.6K images at up to 120 frames per second, windowed 4K DCI at up 150 frames per second, and windowed 1080 HD at 300 frames per second. The broadcast camera design of URSA Mini Pro 4.6K G2 has external control buttons, switches, knobs and dials on the outside of the camera, giving direct access to the most camera settings. The controls are laid out in a logical order that makes them easy to remember so cinematographers can operate the camera without having to look at the buttons, hunt through menus. URSA Mini Pro 4.6K G2 also features a high visibility status screen that displays important information such as timecode, shutter and lens settings, battery, recording status, and audio levels. The status display features a backlight and is designed to be clearly visible in both dimly lit studios and outside in direct sunlight. 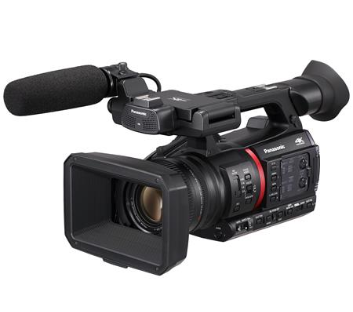 The Panasonic CX350 is the industry's lightest 4K10-bit camcorder optimized for 4K/HD production with live broadcasting capabilities. The CX350 brings impressive new features including 4K 10-bit 60p capture and HDR recording and is equipped with the RTMP/RTSP/RTP protocol for live streaming and NDI | HX-ready IP connection. At only 4.2 lbs. (body only), it has a 20X optical zoom lens and its integrated lens contains a wide angle of 24.5mm at the wide-angle setting with minimal distortion. Its new 1.0" 15M sensor brings 2,000TV-lines and F12/F13 sensitivity. It also captures 720p AVCHD 8-Mbps for video analysis and is compatible with DV Sports and XoS Digital. The second camera I want to look at is the AJ-PX5100. It is a B4 shoulder-mounted P2HD ENG camera, featuring a lightweight body and offering HDR (HLG) content, 1080/60p recording and a 3G-SDI output. It supports AVC-Intra or AVC-LongG high-quality images and dual codec recording of AVC-Proxy. The PX5100 supports HDR image acquisition and outputs SDR while acquiring HDR. It includes various network connections, such as wired/wireless LAN, 4G/LTE, and Bonding Services with LiveU, TVU Networks and more. 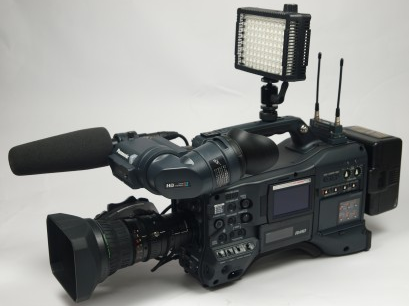 It's ideal for network news, documentaries, high-end corporate/sports production, and rentals. Lastly, I will be definitely looking at the upgrades on the Varicam line up. Unfortunately for me, it has been quite a while since I last shot on the Varicam so I am quite anxious to see the upgrades in action! JVC will showcase its expanded CONNECTED CAM product line with the new 500 Series of streaming handheld camcorders. When paired with any JVC ProHD Bridge product, each of the three models provides reliable 1080p streaming performance up to 20 Mbps with SMPTE 2022 forward error correction and low latency. One model, the GY-HC550, also includes dual external antennas with built-in wireless LAN, integrated GPS, and Zixi error correction with ARQ. Beyond streaming, the cameras feature a 1-inch CMOS imager and integrated 20x zoom lens, and can record 4K at 50/60p to SSD media in 10-bit ProRes 422 (among other native file formats). The GY-HC550 adds lower-third and full-screen titling options for recorded or streamed video output without an external CG. Who doesn’t want a new field monitor? These next two are on my 2019 NAB hot list for sure. Atomos Shinobi - a high brightness 1000nit 5-inch HDMI monitor that’s perfect for vloggers, creatives and photographers. When you’re shooting video on mirrorless cameras and DSLRs, the Shinobi is packed with the latest features but is small and light enough to take anywhere – weighing in at a mere 200g (7 oz). Shinobi shares the same HDR 1920x1080 display and color processing found in the multi-award-winning Atomos Ninja V monitor/recorder. With a professional 1000nit brightness screen it can be seen clearly even in daylight. It has an impressive pixel density of 427 PPI (pixels per inch) and is factory calibrated for color accuracy. Shinobi can run for up to six hours on a single Sony NP-F750 type battery. A clear on-screen battery gauge shows the status of the battery and when it is running low. The central position of the battery mount on the rear of the Shinobi ensures good balance when mounted to mirrorless cameras. Atomos is well known for its Atomos 10 system with simple to use touch-screen interface. Shooters can magnify the image or engage peaking to check focus, pull up false color, a histogram, zebras or waveform to gauge exposure or add guides or markers to aid composition. The interface has clear icons which allow the image to be the focus of attention – and with a swipe, all the menus go away for a totally clear view. Vloggers will especially value the flip-screen function which mirrors the image when you are filming yourself talking to your audience. For broad compatibility, the Shinobi’s HDMI port can accept signals up to 4K (4096x2160) at 30fps, or HD video up to 60fps. The screen can also perfectly display 10+ stops of dynamic range when being used with Log or HLG HDR outputs. Atomos’ advanced color science gives a complete range built in gamma presets to match popular cameras when shooting Log or HLG. 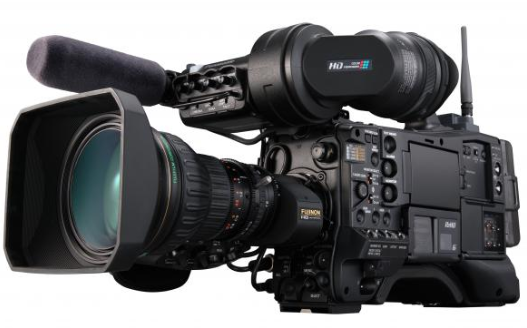 Although the Shinobi is designed primarily for smaller cameras, its advanced features mean that users of larger cine cameras, traditional camcorders or other Atomos monitor/recorders may also find it an excellent additional monitor for their needs. It also enables operators on multi-camera shoots to have the same high-quality HDR monitoring on additional cameras. Not to be outdone here comes Small HD with the Focus 7. Yet another field monitor we will be trying out hopefully later this year. 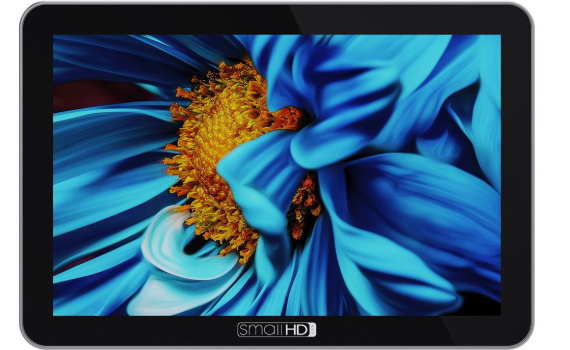 SmallHD unveils its first 7-inch touchscreen monitor, the FOCUS 7. Modeled after the 5-inch FOCUS, it is designed for use with low-profile camera setups. Daylight viewable, the FOCUS 7 provides full HD resolution and power output functionality. 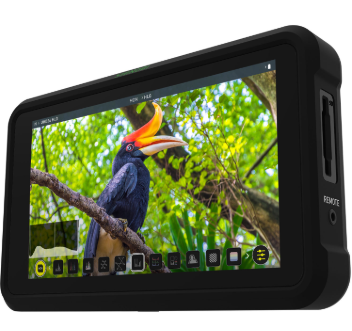 “The original 5-inch FOCUS monitor was successful because it made shooting with a small DSLR or mirrorless cameras so much easier,” says Dale Backus, SmallHD Co-Founder. “The FOCUS 7 offers similar functionality while adding display size and resolution, without adding bulk.” The new monitor weighs less than a pound. The FOCUS 7 on-camera monitor features a 1000-nit bright, 1920x1200 resolution, IPS LCD touchscreen display. With a full-size HDMI input, it is capable of accepting video up to 4k resolution at 30fps. The 2 integrated Sony L Series battery slots are conveniently hot-swappable. In addition, this monitor provides a 3.5mm barrel output that can supply power to small DSLR and mirrorless cameras, using battery specific adapter cables. The landscape is wide open here and I cannot wait to see what’s next. By the way, micro production does not mean small results. I am referring to micro in footprint. SlingStudio is one booth I am not going to miss. With new upgrades to their small production packages, I will be excited to see what they bring to the table next. I am scheduled for a new review with them so stay tuned. Along with SlingStudio, Panasonic and Newtek bring their small switchers along for the ride. What is the big take away going to be from 2019 NAB? That’s easy - more professionals doing more production on more levels than ever before. That is the beauty of NAB. Without a doubt, the landscape is changing. From large production trucks and sprinters to your whole workflow in a backpack. It is what you want it to be. I would say to focus but then you would be cheating yourself. Set up your show to include things you need to see, want to see, and leave some room for some fun too! My fun this year will be all things eSports! I am always eager to learn new technologies and with millions of dollars at stake, I cannot wait to see eSports up close and personal.